As I was going to use mango, I wanted to keep the beautiful vibrant colour, so other than using our normal kefir base, I decided to keep the orange hue. Carrots were an obvious choice as was the dried orange powder my mother kindly supplies me with, but I also added a few dried calendula petals – not too many as they can be bitter, but enough to know we’d got a few additional micro-nutrients. Bee pollen and baobab powder, both being orange, were also on the list. Even our hawthorn extract has an orange tint. The mango carrot smoothie was delicious. The mango was plenty sweet enough to take any edge off the other ingredients and although essence of carrot was detectable it didn’t detract from the tropical, sun-kissed flavour of mango. As always, I blended it in my Optimum 9200 Next Generation, which made short shrift of the carrot and flower petals and dispersed any hard bits remaining in the dried orange. My mother dries the peel of any organic oranges she eats, then attempts to blitz them in a coffee grinder. This isn’t quite up to the job, so there are always bits of hard peel amongst the powder. She uses it sprinkled on her muesli. I use it in baking and in smoothies. Of course if you prefer not to use any dairy in the mango carrot smoothie, you can substitute a nut milk of choice for the kefir. The kefir does make it quite thick, which means you can eat it with a spoon if you prefer a breakfast that feels a bit more substantial than a drink. The bee pollen can of course be omitted for vegans. If you’d like to find out more about kefir, head over to my post on Kefir – what it is, how to make it and what to do with it. A vibrant orange kefir smoothie, which is not only tasty but is full of good things that will set you up well for the day and keep you going until lunchtime. Place all ingredients into a high speed blender and blitz for about 30 seconds, or use the 35 second cycle on the Optimum 9200. Pour into glasses or bowls and sip or eat with a spoon. If using the zest of an orange, add the juice in too. As CT picked these mangos up for song, I am sending the recipe for mango carrot smoothie to Credit Crunch Munch. Normally hosted by Camilla of FabFood4All and Helen of Fuss Free Flavours, it is this month being guest hosted by Charlene over at Food Glorious Food. I use the Optimum 9200A for smoothies, spreads, sauces and even chocolate making. All links to the blender are affiliate ones. If you buy one through one of the links, it will not cost you any more, but I will get a small commission. This is not a paid post and as always, all opinions are my own. This looks so delicious. I have never thought of combining mango and carrot but I imagine they pair well together. Reminds me of mango lassi’s on the beach in Sri Lanka. Mango lassis in Sri Lanka? Now there’s a thing, Sus – I’m dreaming of it now as I watch the rain lash down. So creamy! Medicinal extract is new to me. Thanks Angie. A better description would be herbal tincture – I’ve just changed the wording. Sounds great! I love the taste of mango. Awesome that you were able to keep the vivid color, too. I never would have thought of using carrot. Genius! Thanks Leisel. I’m not sure if it’s genius or twisted mind, but it worked wonderfully well. I’ve never come across kefir before so thats a new ingredient on me. Definitely going to try combining mango and carrot in my next smoothie. Yum, so delicious. Mango and carrot taste so so good together. I will have to try this out! It was a new combination for me Ciara, but it worked and I’ve made a few more smoothies since. Yum! I love mango smoothies…. never would have thought of adding carrot to the mix. Can’t wait to see what it’s like! Thanks Riz. You may have noticed, I like to surprise in my recipes and push the boundaries a little. This sounds amazing – a real taste of the outdoors and bet its insanely good for you. Mangos have such a wonderful flavour, they make one of the best fruit smoothies. oooh, mango and carrot… that’s a new one for me but I SO get it. Looks very smooth! I love mango smoothie and the addition of carrots is such a good idea. I never would have put these two flavors together on my own, but this makes me want to do it! Yay Whitney, go for it. The great thing about food bloggers is that they are always coming up with interesting angles. mango and carrot, both my favourites. So, I can definitely try this smoothie! Hope you enjoy it Priya. ohh this looks so luscious and thick and fresh!! Using kefir always makes for quite a thick smoothie, which is great as you can eat it with a spoon if you prefer. I’ve never really gone a bundle on smoothies in fact I have never tried one (yes there still are some of us out there) but the flavours in this sound fantastic I love the idea of the bee pollen and marigold petals should add a really unique flavour profile. Haha Brian, I’m a recent convert to smoothies so I do understand. I really like them as you can pack them full of nutrients and they almost always taste great. Yay, smoothies! I’m having one this very moment, but it’s very basic compared to the amazing combination you have going on here. I’m really intrigued by the list of ingredients; I’ve never had baobab powder or bee pollen, but I’m all about trying new super foods! I know I can find baobab powder at Whole Foods, I’ll have to see if they carry bee pollen as well. Thanks for sharing! Thanks Marissa, smoothies are wonderful indeed and there are so many exciting things to put in them. Most good whole food shops should sell bee pollen. This sounds like liquid sunshine in a glass! Ooh, it was lovely Emma. Mangos are just so delicious. Thanks Charlene, do give it a go and let me know what you think. CT is the kefir maker Helen. Would be way too expensive to buy it. Once you start making it though, it produces masses – hence are regular kefir smoothies. Such an intriguing smoothie! We used to sell bee pollen in a health foods store I used to work at, but I’ve never tried it before. I must! I’ve made this a few times since Elizabeth, it’s a good one. Bee pollen is quite expensive, but it lasts a long time, so I buy it in large packs which works out a bit cheaper. It’s meant to contain all sorts of wonderful nutrients. Gosh this looks like sunshine in a glass! I adore mango in a smoothie and the way the Froothie processes them leaves them so silky. Yum! Thanks Sarah. 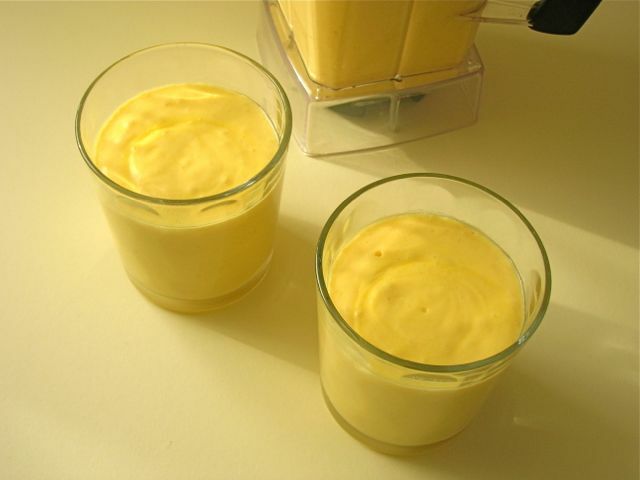 The Froothie is just wonderful for making ingredients really smooth and mangoes are particularly good – I’m loving it. Oh my, that has to be one of the healthiest breakfasts around! Love the idea that you’re adding in lots of extra goodies for their micro nutrients, whereas I must be honest I tend to add things mainly for flavour!